With spring on my mind I have been wearing pastels more frequently as of late. I recently got this sweater because I loved the color and have been wearing it non-stop! I love that it's not too heavy or bulky, so I can easily transition it into spring (with white denim and flats!) For a more monochromatic look I added my newest Kendra Scott necklace from her Avant Garden collection! 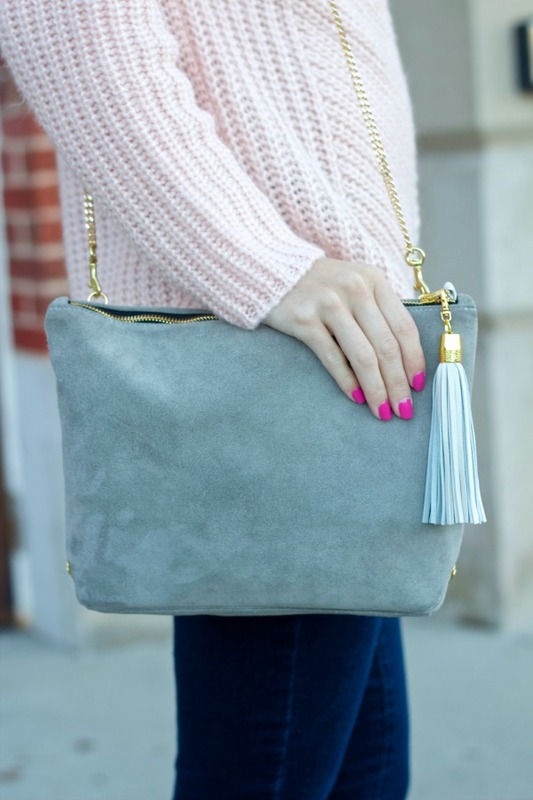 Oh and gray is always a go-to with me, especially in the winter months! I added my Sam Edelman booties and my Blair Ritchey bag to this outfit to keep it seasonally appropriate! Both have become wardrobe staples for me. The booties seem to go with everything from tees and skinny jeans to dresses! The Blair Ritchey PAK bag is not only gorgeous, it's also really functional. With it's removable strap it can be a cross body or clutch. It also has ample room inside- I love that it will fit my Hobo wallet, as not many clutches can!